Utes have won the last two meetings at Rice-Eccles Stadium, via last-minute touchdowns. Chris Detrick | The Salt Lake Tribune file Utah Utes wide receiver Tim Patrick (12) celebrates with his teammates after the game at Rice-Eccles Stadium Friday September 23, 2016. Utah Utes defeated USC Trojans 31-27. Patrick scored the game-winning touchdown. In three of the past four football meetings between Utah and USC, a mere yard decided the game. The Ute secondary's challenge Saturday night is to keep the Trojans from gaining yards in bunches. 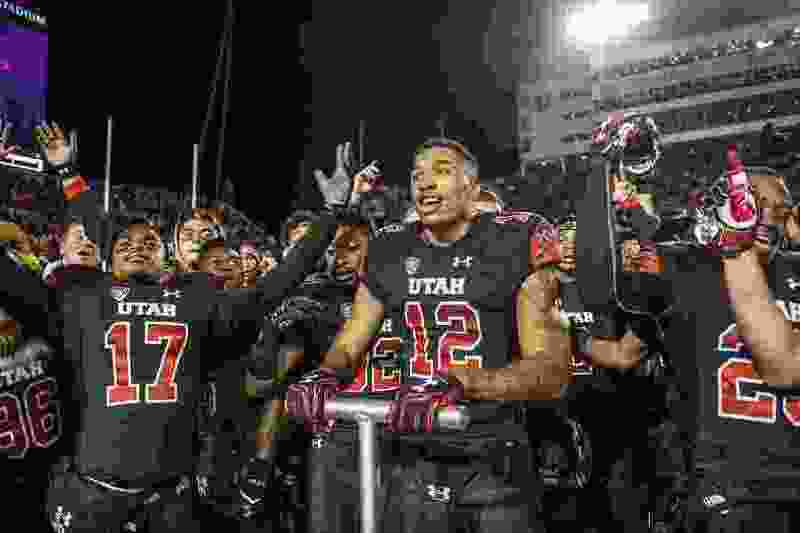 The Pac-12 South’s best series of this decade will be renewed during homecoming weekend at Rice-Eccles Stadium, where dramatic drives have given Utah victories in the Trojans' last two visits. USC could take command of the South, having righted itself after a slow start. Utah took a 6-0 record and No. 3 ranking into the Los Angeles Coliseum in 2015, when USC won convincingly. Both teams are unranked, yet the current stakes might be bigger in their own way. Utah will wear throwback uniforms with design elements from the 1960s, ’70s, ’80s and ’90s —decades when the program never claimed an outright conference championship. The Utes believe they’re good enough to win their first South title, considering how they’ve played against Stanford and Arizona this month. But a loss Saturday would put them two games behind USC, with the Trojans owning the tiebreaker and a scheduling advantage. Recent history, aside from USC's 42-24 win three years ago, suggests this game could become another classic. One yard, at the right moment, could mean everything. USC could have run out the clock with a 21-17 lead in 2014, but receiver Nelson Agholor stepped out of bounds a yard short of the first-down marker on an inside reverse on fourth and 2 from the Utah 28. The Utes drove to the winning touchdown, Travis Wilson's 1-yard pass to Kaelin Clay. In 2016, Utah's Armand Shyne and Zack Moss each converted a fourth-and-1 play on Utah's winning drive. Last October, Ute quarterback Troy Williams was stopped a yard short of the goal line on a 2-point conversion attempt in a 28-27 loss. Saturday’s game also should be close. That’s the word Ute offensive coordinator Troy Taylor used about his group, during its struggles of September. “What I kept saying to the guys is, ‘We’re really close. Don’t panic. Keep working. Just make a couple plays here or there and we’ll get this thing turned around.’ And that’s what happened,” Taylor said. Taylor’s offense is now dependable enough to score in the high 20s against USC. It sounds crazy to say, but the pressure now switches to Utah’s defense, especially the secondary. Utah’s coaches are defensive about the raw passing yardage that opponents have gained in the last three games, pointing to a No. 1 ranking in the Pac-12 in pass-efficiency defense. Yet the defensive backs have been vulnerable to long passes, and that’s USC’s game. Ute coach Kyle Whittingham is a football guy. His knowledge of the Trojans comes strictly from film study. In his weekly news conference, he recited the jersey numbers of the USC receivers: Nos. 1 (Velus Jones Jr.), 6 (Michael Pittman Jr.), 8 (Amon-Ra St. Brown) and 21 (Tyler Vaughns). Colorado coach Mike MacIntyre was disappointed with how the Buffaloes defended the long pass in last weekend’s 31-20 loss to USC, with his defensive backs failing to adjust to the ball in the air. Ute cornerbacks Jaylon Johnson and Julian Blackmon will have to make those plays, while avoiding the holding and pass-interference penalties that have hurt Utah lately. For a defensive coordinator, there's always an opposing player to worry about. As Scalley said, “Every week in the Pac-12, it's someone different.” It's also true that Stanford running back Bryce Love didn't dress against Utah and Arizona quarterback Khalil Tate left after two possessions with an injury. The Utes will face the Trojans' full complement of receivers Saturday, while hoping USC is not the team completing a last-minute touchdown pass in this episode of the series. Records: USC 4-2 (3-1 Pac-12); Utah 4-2 (2-2). Series history: USC leads, 11-5. Last meeting: USC 28, Utah 27 (2017). About the Trojans: WR Michael Pittman gains 22.2 yards per reception. … Senior LB Porter Gustin, from Salem Hills High School, is out for the season with a broken ankle. Redshirt freshman DT Jay Tufele, from Bingham High, has made two tackles for loss. … Senior C Toa Loebendahn’s father, Vince, was a Ute linemen in 1990-93. About the Utes: Jack Tuttle’s departure makes Jordan High alumnus Drew Lisk the No. 3 QB. … The Utes are 2-0 in October after going 0-4 in October 2017. … Utah is 2-5 vs. USC in the Pac-12 era.